« FLOGGING MOLLY HITS CHICAGO FOR TWO DATES! 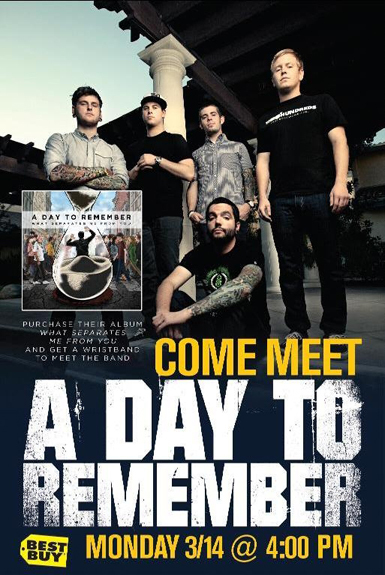 The first 200 fans to purchase A Day To Remember’s latest album, What Separates Me From You, starting on Friday, March 11th at 5pm at the Best Buy Union Square, will receive a wristband which guarantees admittance to the event on Monday, March 14th at 4pm. Arrive early as time and space are limited. This entry was posted on March 10, 2011 at 10:44 am and is filed under News with tags A Day to Remember, Best Buy, NYC, signing, The Rock Tribune, What Separates Me From You. You can follow any responses to this entry through the RSS 2.0 feed. You can leave a response, or trackback from your own site.